As a creative entrepreneur, it’s easy to get caught up in the day-to-day. It’s a gentle balance of putting my head down and doing the work, and having enough time and space for my thoughts to wander and my creativity to find home. And when that balance is off, it’s hard to catch my breath, bouncing to the next project, the next to-do on the list, only giving my mind a chance to rest as I fall asleep at night. That’s where my head was at before I left for Palm Springs. It was that cluttered space, where even though life had slowed, I was still operating at the same frequency as before. However cliche, they say life begins at the end of your comfort zone. To that effect, traveling solo is a new thing for me — it’s not often that I show up at a location I’ve never been to before to hang out with friends that I haven’t met yet. And yet somehow, that’s exactly what I had signed myself up for with Designer Vaca: a retreat of about 150 female designers from around the globe. 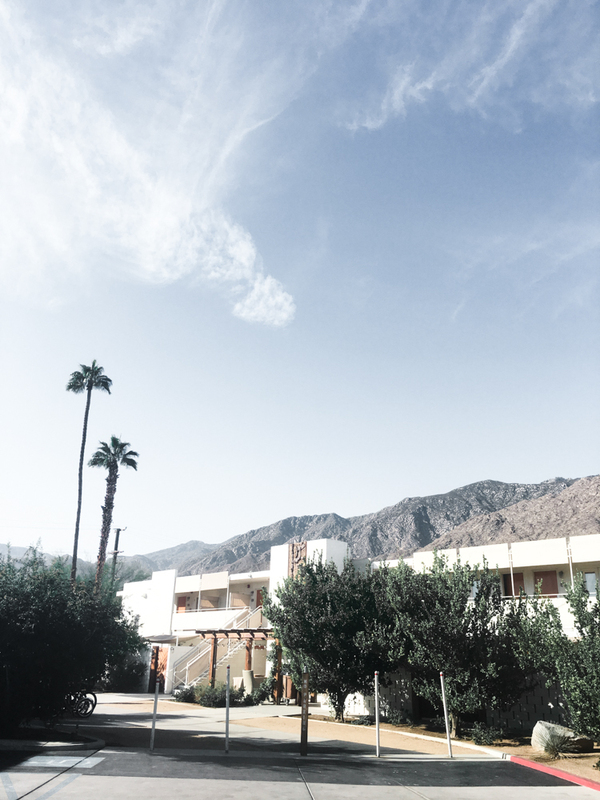 So there I was, retrieving my luggage at the tiny (and I mean tiny) Palms Springs airport, bleary-eyed from my early-morning flight and filled with butterflies. Luckily, warm weather and palm trees have an amazing ability to quell nerves. Enter the Ace Hotel. To say it’s a designer’s paradise is putting it lightly. I was in awe of the seamless balance of minimal and interesting. Rooms were filled with just enough creature comforts to make you feel at home (I mean look at those robes! ), but nothing over the top. And details were spot on throughout, from the lettering on the room key cards to the murals around the property. I was going to do just fine here. And that I did. But what surprised me most about the retreat was the genuine warmth of everyone that attended. It’s rare to get so many successful women in a room and have their egos 100% checked at the door. Mornings were filled with inspiring speakers and small group sessions, and afternoons with watermelon margaritas and talking shop by the pool. I met some inspiring ladies I’d only ever “known” through Instagram and others whose podcasts I had admired from afar. It was a strong reminder of “community over competition,” the idea that within the community we have a support system to build each other up, lifting the industry as a whole. It was a short trip, and I wish I could say that I went beyond the beaten path, explored the surrounding area, and got my hands dirty, but this wasn’t that kind of trip. It was a time to rest, to inspire, and to remember why it is that I carved this path for myself.